The West Midlands region of England is jam-packed with golfing delights, including some first class resorts. West Midlands is rated 4.4 out of 5 based on 422 verified reviews from YGT customers. They played and stayed (we even checked they signed their scorecards). The most notable are The Belfry, whose credentials are unquestionable, having hosted the Ryder Cup on four occasions, in addition to the British Masters and English Open. Its Brabazon Course is one of the must-play tracks in the whole of England. 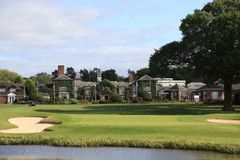 The nearby Forest of Arden is also a proven tournament host, having welcomed the European Tour’s best on more than one occasion, and like The Belfry is in close proximity to Birmingham, the country’s second city. It is here that visitors will find superb shopping opportunities, especially in the Bull Ring, and also a myriad of bars and clubs for a lively night out. This excellent golfing region is also the home of cracking resorts like Hilton Puckrup Hall, Abbey Golf Hotel and the Welcombe, all of which are perfectly equipped for your next golf or leisure break in the West Midlands. Summer is the peak season for golf in England, when the warmer weather entices golfers of all degrees to hit the fairways. This demand results in higher green fees, so if you’re looking for value, the autumn and spring seasons may appeal. For a real bargain, we suggest taking advantage of our Sunday Specials with exceptional value to be had on overnight breaks.